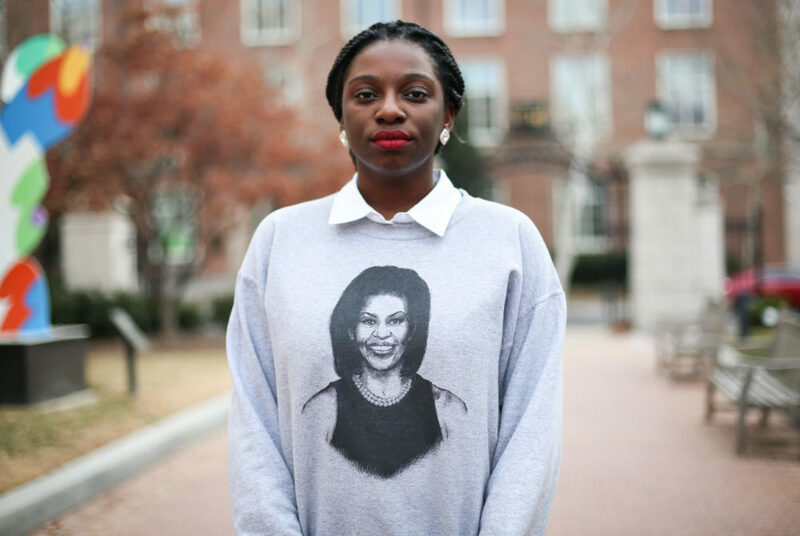 Abiola Agoro, the president of GW’s NAACP chapter, said the photo depicting Alpha Phi members was disappointing but not surprising because minority students often have to deal with coded racism on campus. The outrage following a photo of two sorority women with a racist caption has turned into a movement for change on campus. In the days since the Snapchat post triggered a wave of backlash, black student leaders have called for major reforms to educate the student body about diversity and ensure that there are strict punishments for offensive behavior. Students said in interviews and at an open forum on diversity that incidents like the one last week are a frustrating and recurring part of their experience at GW. Black student leaders are publicly calling for the removal of Alpha Phi – the sorority whose members are featured in the post – from campus. GW’s NAACP chapter and other student leaders are also demanding long-term changes on campus including mandating diversity training for all students and faculty, calling for regular meetings with top-level administrators and setting up an anonymous resource website for students to report racist incidents on campus. The Student Association will also consider legislation Monday calling for the removal of Alpha Phi, creating a task force to investigate racial discrimination in Greek chapters, hiring a person of color as the new dean of the student experience and adding sections of the student code of conduct to address “racialized” language. Proponents of the resolution are urging members of the community to show up to the meeting wearing black to support the proposals. The resolution, known as the “Alpha Phi Bigotry Act,” has been endorsed by several major student organizations including the GW NAACP chapter, Black Student Union and Black Women’s Forum. She declined to address the specifics of the proposals. On Thursday, the NAACP released a letter on Facebook addressing the incident, which included a list of demands and recommendations, including more diverse leadership at GW and mandatory diversity trainings for students and faculty that cover the history of racist language and teach behavior that is inappropriate around people of different racial and ethnic groups. The letter also recommended creating a rehabilitation program for students who make racist remarks or are involved in incidents of racism and the creation of a judicial committee, where multicultural student leaders will be given a platform to deal with “racially charged” situations involving their peers. Agoro said she and her entire chapter want to see Alpha Phi removed from campus but also hope the incident creates conversations about how to make minority students feel included on campus. “I know some people were like, ‘oh it was just a banana,’ but when your entire life you’ve been referred to as apes, whenever your men have been referred to as apes, whenever your men are referred to as gorillas when they get upset, there’s history there,” she said. Keiko Tsuboi, the chapter leader of Young Progressives Demanding Action, said following the NAACP’s recommendations would be the University’s best response to the post and that simply hosting town halls and calling for more diversity training won’t spur real systemic changes. Tsuboi said Maltzman’s statement Thursday that the incident wasn’t reflective of GW was frustrating because many students of color felt it was indicative of their experiences on campus. “I think that this is reflective of GW and you can’t dredge up this image of the University being this type of haven for students from all over the world if that’s not what it really is right now, and maybe that’s something that you should be working toward,” she said. SA Sen. Imani Ross, U-at-large and the chair of the senate’s student life committee, who introduced the SA resolution, said the Snapchat photo reflects not a single instance of racism at GW, but a continuation of insensitive remarks that students need to know are unacceptable. The Black Heritage Celebration and the Black Student Union held a community forum Thursday night to react to the post and address how the University should move forward to address the issues it raised. SA President Peak Sen Chua said the meeting gave black students a platform to address issues that have affected their community for a long time. “I think it was a space for them to express their anger, their discontent, their sadness of the issue, but also an opportunity for them to figure out what to do next, but also how to use this moment of unity through a situation of racism to try and change things at this University,” Chua said. Racial diversity and treatment of minority students has long been a topic of conversation on campus. Two years ago, SA leaders went through mandatory diversity training after members of the South Asian Heritage Celebration objected to their treatment by an SA committee. In November 2015, officials declared their support for students of color after a series of protests at the University of Missouri prompted colleges nationwide to discuss racial inclusion. Nearby American University has also dealt with racist incidents. In May, nooses and hanging bananas appeared on the University’s campus, which students and administrators said were meant to intimidate black students. Just last week, AU announced a $121 million plan to address diversity, including new scholarships and the creation of a mandatory freshman course focused on race and social identity. Leaders in the Multicultural Greek Council said sororities and fraternities in Panhel and IFC have struggled to harbor diverse membership, and diversity trainings could help address some of the concerns raised by the photo. Elizabeth Jessup, the president of the Panhellenic Association, said she supports the idea of having more diversity training for members of the Greek community. “I think more diversity and inclusion training is an essential first step both within the Panhellenic Association and IFC [Interfraternity Council] and within GW as a whole, but it needs to be accompanied by additional action like changes to our student code of conduct and to the Panhellenic bylaws to more adequately address issues of discrimination when they occur,” Jessup said in an email. Malcolm Elashari-Rashed, president of Kappa Alpha Psi, a fraternity within the Multicultural Greek Council, said that while diversity training is never a bad idea, it might be too late to change people’s minds. He said Greek life officials should create a zero-tolerance policy, eliminating the grey area regarding ramifications after an incident like the Snapchat photo. Ethan Stoler, Cayla Harris, Sarah Roach, Annie Dobler and Andrew Goudsward contributed reporting.